Great rabbit hunt urged But is shooting rabbits, legal, safe? Thousands of fast-breeding rabbits munching their way through Richmond’s farmland could threaten crops elsewhere in the Lower Mainland if they make a beachhead across the river. And Coun. Harold Steves said it almost happened by accident when rabbits trapped in his city last month were being released in Burns Bog—an ideal bunny-breeding base. Steves is encouraging Richmond farmers to shoot the rabbits and he says the city should also lead an organized cull. “We’ll have four times as many rabbits as last year unless we do something about it now,” he said. MacCarthy said there may be overlapping jurisdictions to consider as well, such as the federal wildlife act. He’s aware of civil litigation resulting from hunting accidents, but isn’t aware of a situation where someone’s been hurt by a farmer trying to protect his or her crop. And Richmond RCMP Cpl. Peter Thiessen said he’s concerned about public safety being compromised and said as far as he’s aware, discharging a firearm within city limits is against the law, under the criminal code of Canada. “Certainly it’s a concern if people aren’t taking safety into consideration.” He is worried that some unsuspecting family picking blackberries in the dense brush might unwittingly step in the line of fire as a farmer aims his sights on rabbits. Thiessen said a few nights ago, police responded to the area of No. 5 Road and Steveston Highway, where they found two adults and two children shooting rabbits, intending to eat them. Shooting rabbits is a complex issue, Thiessen said, with provincial, federal and possibly municipal laws that must be taken into account, depending on where one resides. Is a farmer going to use a pellet gun, a shotgun, or a revolver? And is that weapon registered, as required by law? Steves blames residents who for years have bought pet bunnies and later abandoned them in the Richmond Nature Park. More and more people took to releasing unwanted domestic rabbits in the same spot, he said, and the population spiraled from dozens through the hundreds and up to an estimated 5,000 now. Some farmers have had to replant crops several times this year, and Steves said one farm estimates it has lost $30,000 worth of crops to bunny attacks. Local community gardens have lost half their vegetables and the food bank, which normally gets surplus produce from farmers, is also expected to suffer. Shooting the rabbits is the most efficient way to cut the numbers, Steves said. 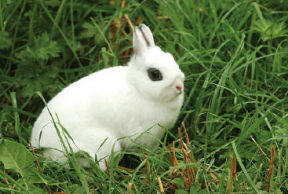 The problem of pet rabbits being released and breeding in the wild isn’t only Richmond’s. Steves said it doesn’t tend to be a problem in open areas, where coyotes and eagles can control the population, but they can survive and multiply in areas of low brush and thickets. “The whole Lower Mainland is going to have to look at what we allow to be sold in pet stores,” he added. Too often bunnies are bought at Easter as pets that children tire of within six months or a year, he said. Other cities in Canada and the U.S. are taking steps to ban or restrict bunny sales to prevent the problem. “If rabbits are sold in pet stores they should be spayed or neutered,” Steves said. B.C. SPCA officials say they don’t necessarily object to a rabbit cull using guns, as long as it’s done professionally. “Gunshot euthanasia, if done correctly, can be a humane death,” said chief animal protection officer Shawn Eccles. “It is relatively pain-free and it is quick.” The concern is if rabbits are shot but not killed. An increase in the local rabbit population has some calling for a cull on bunnies. “How do we know these animals aren’t going to be wounded and running off, suffering and not receiving any care?” he asked. With a large increase in the Richmond rabbit population this summer, Coun. Harold Steves has called for a rabbit cull. The rabbits are eating many of Richmond’s farm crops. Eccles said the existence of colonies of feral domestic rabbits “all over the Lower Mainland” underscores the need for more responsible pet ownership. Society for the Prevention of Cruelty to Animals shelters are overrun with rabbits, but do still accept them. Eccles also said Vancouver Rabbit Rescue and Advocacy, a new society, has been formed to try to care for the animals and find homes. Shawn Eccles says the B.C. SPCA doesn't "necessarily object" to "gunshot euthanasia" if it is "done correctly." Considering that there may be close to 5,000 rabbits running around how many would be included in the "cull?" If there is even one female and one male remaining the population would be right back up there in no time as rabbits can reproduce about every 30 days. To start shooting randomly at these rabbits makes absolutely no sense at all, and if the irresponsible public keeps buying and dumping them, as they will, then what? And speaking of "more responsible pet ownership", what about the B.C. SPCA's business partnership with Petcetera, whose retail outlets continue to sell baby rabbits to just anybody who walks through their doors? How can this be justified? So it comes as no surprise that killing off masses of dumped domestic rabbits is not too much of a concern with this agency, provided of course, that it's done properly. Is this supposed to be 21st century animal welfare and leadership, SPCA style? Comment : Rabbit Advocacy continues to lobby government to end sales of rabbits in pet stores, rather than employing costly and ineffective measures to have them killed. A humane society simply wouldn't do it. And for the BC SPCA to find "gunshot euthanasia" acceptable, demonstrates a total lack of empathy, not to mention stupidity. Farmers have said electric fences, live traps, and other measures have failed to keep the rabbits out of fields and gardens, and because populations continue to expand, Councillor Harold Steves says that under B.C. 's Right to Farm Act, farmers should be allowed to shoot the bunnies. Evidently the City of Richmond scheduled a "cull" for the Fall of 2006, but it was called off because "nature had taken care of the problem with disease and starvation." (Richmond News, Nov. 13, 2007) However, it appeared as if the population had been virtually eradicated overnight. EBB Environmental Consulting, based in the Lower Mainland, and awarded the rabbit control contract for Kelowna in May of 2008, stated to council that they had overseen a rabbit-control program involving the killing of the animals in another municipality. In correspondence with the City of Richmond in May 2008 we were advised that as part of a broader wildlife management plan, portions of the plan recommended by EBB were implemented. The program involves "selectively moving or euthanizing rabbits on public land where the population has become destructive." Killing the homeless is not only heartless, it's a waste of taxpayer dollars, and won't prevent future populations from springing up. Whether animal control activities are conducted in "a professional and ethical fashion that focuses on addressing public health, safety and other concerns in a humane manner" we cannot keep eradicating other species and destroying the environment so as to accommodate only human life. Keep the pressure on all levels of government to implement proactive measures to reduce impulse buys and to restrict breeding. Companion animals are for life. They are a privilege, not a right. This is just common sense.